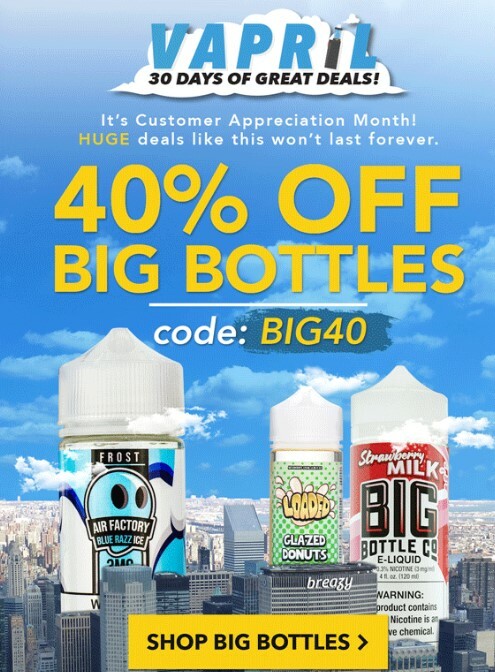 Vapor Joes - Daily Vaping Deals: LAST DAY: 40% OFF BIG BOTTLES - INCLUDES SALE ITEMS! LAST DAY: 40% OFF BIG BOTTLES - INCLUDES SALE ITEMS! The last day of this sale is here. Save 40% off big bottles. This sale includes juices already marked down for even more savings! Today is the last day according to Breazy - so get in while its still going.